Todays post will be of a somewhat different theme than my normal posts, but read on anyway – you might just find some more tips – or perhaps just ONE GOLDEN tip that will stand you in good stead not just training wise – but LIFE wise. As I finished up with 200 pushups and 100 squats this afternoon, it seemed like literally nothing to me. Was a tough, tough workout from 0 Excuses Fitness – some of those exercises would kick the average “gym junkie” in the can if they even tried one rep – or two at best. And quickly, at that – but as I finished off with 50 reps of the best darn exercise there is, I felt something was missing. Nah – not missing. I felt the need – to do MORE – though I had already done more than plenty, hehe. And so off I went into the great ole yonder. Now, just to let you know – it’s been a damp, dank and DARK – not to mention WET winter day. The temperature on my phone reads around 5 degree Centigrade – but the rain and wind chill makes it feel like about -10. No worries. Pulled on a sweat shirt over my T-shirt, laced up my shoes – and once I was past the “inquiring” stare of the lady that clears the garbage bags from my apartment building – I heard the usual “lao wai” chant – in other words, there goes the crazy man from the foreign land. And I must admit – today’s a day where few would want to step out – let alone TRAIN – let alone do MORE after a tough, tough workout. Let alone in a pair of shorts, but hey, thats ME, hehe. The security guards peeped at me through their windows as I headed off to the park. The look in the eyes said it all – ah, but you know what that look is, don’t you? But as I pondered how best to bang out pull-ups on a slippery – wet – bar, I figured it was best to give it a miss for today – but I replaced it with 50 handstand pushups. Wait a minute, I hear you saying. Is this about your workout or a “dedicated to” thingy? Didn’t you just say “this post is somewhat different”? Well – actually I did – and as I was banging out handstand pushups – done DIFFERENTLY from how most people do ’em – I saw a dude running on past me, umbrella in hand. He was a guy that I often see in the park – jogging – but doing so with an umbrella in hand – and JOGGING – UP – a mountain of all things in this sort of weather? Now that’s sheer DEDICATION, my friend! THAT is what I talk about in 0 Excuses Fitness when I speak of GUMPTION – and “getting her done” no matter what! THAT is what I refer to by 0 Excuses! But there’s more – as that dude passed me by, I was on rep #9 of my pushups. Come rep # 15, and I took a breather – and what do I see – but another young Chinese dude running on past me in T-shirt and shorts – in this weather – obviously out for a jog. THAT is what I refer to by not skipping workouts unless you really, really have to! And while I obviously had to skip the pull-ups I had planned (impossible to do ’em outdoors in the rain) – I replaced it with 50 handstand pushups instead of my usual (when I do more) mix of the above 2 exercises. So I still got here done – well, to the best of my ability anyway. Couldn’t get my finishers in in terms of grip work due to the slick surface – – but all good – – my forearms feel worked to the bone anyway – – and I’ll get back to what I was about to do tonight TOMORROW! Man oh man. My traps are screaming – without doing a single pull-up. So is my upper back, and so are my FOREARMS! Anyway, this workout is dedicated to those of you that follow the 0 Excuses philosophy, my friend. I’m not a fan of hoisting heavy weights – and yet – it matters not what exercise or routine you do – its the DEDICATION that matters! It’s the MENTALITY that counts – the “git her done” no matter what SPIRIT that counts!! Elite forces all over the world have it, as do elite athletes. So do the few folks that train seriously, and train like they MEAN it. And so do all of YOU “0 Excuses” DOERS – my friend – and today’s workout is dedicated to YOU! Last – but not least – this workout is dedicated to my BROTHER – a man who I’ve written about before – and a man that has already achieved / accomplished BEYOND – above and BEYOND – what most folks could even dream of in their lifetime. A man whose got skills that would knock the average Joe on their cans in less than a few seconds – and I’m NOT referring to physical skills alone. A man that’s accomplished all he has – – despite being in situations that most wouldn’t even dare to dream of – – rather than FACE – – and CONQUER – – and do so with COURAGE, PRIDE and DETERMINATION – – not to mention SINGLE MINDED – – and bloody MINDED CUSSEDNESS! The sheer EMOTION of it all – – and I’m feeling it right now as I write this post to you. And if he’s reading this – he knows who he is – – and if he’s not – – well, he knows it anyway! So that’s today’s dispatch. If you train today – make it a good one – and why? Because you’re not only doing it for yourself – you’re doing it for ME – YOU – and EVERYONE else that trains HARD – and seriously! Be one of the TRIBE, my friend – – don’t let me down! I’ll talk about two VITALLY important, and yet seemingly “hidden” keys to getting better – and QUICKLY – at handstand pushups in this email. 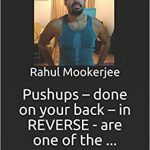 The first is something I’ve mentioned in 0 Excuses Fitness, and mentioned anywhere I talk about pushups, for that matter. And it holds AS true for regular pushups as it does handstand pushups – but DOUBLY – or “triply”, hehe, for that matter with regard to the latter. And that key being to PUSH – UP – all the way! There’s NO “partial” reps or “stopping short of a full extension”, my friend. NONE whatsoever! STRICT reps – and despite what some folks may tell you about this causing shoulder issues – well – it wont. They’re WRONG. Period. 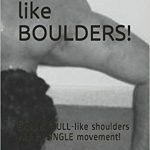 Sure – if you’ve got serious, serious shoulders ailments then it’s probably better not to do them that way – but then again, it needs to be a “serious” (I m ean really serious) problem and b) if it is that serious you’re probably better off not doing ANY pushup until the shoulder gets better, my friend. Anyway, this is even more important for handstand pushups. A LOT of folks seem to ignore that last little push that REALLY gets you pushing down into the ground. A LOT of folks stop “just” short of what I’m saying – i.e. full extension. Granted, they still do them – – and that’s hard enough but the real key to improvement – and quickly (and this is even more true if you’re starting out with these) is to PUSH all the way TILL FULL EXTENSION!! Thats the ONE key – and others are mentioned in my Shoulders like Boulders course – the ONE course that’ll build Brahma Bull like shoulders on you, my friend. You can grab it right here – – https://0excusesfitness.com/shoulders-like-boulders/ — but for now, what is the other tip? Well, again, something I’ve mentioned in 0 Excuses Fitness – that being to maintain focus. FOCUS, focus, and focus as if your very LIFE depends on it, my friend – and while that holds true for working out in general it holds even more true for handstand pushups simply due to the ultra advanced nature of the “beast”, hehe. No “horsing around”. No “checking smart(not)phone updates”. No “ogling the babes on the treadmill” – albeit from an upside down position, hehe. When you train – you TRAIN – with focus – PERIOD! You’re NOT there for any other purpose other than to undertake serious training, and that should occupy your entire mind as well. Try training handstands – let alone the pushups – with anything less than full focus and you’ll soon see what I’m talking about. Oh, and certainly NO “chit chat” either when training. Had a clown come up to me today in the park as I was finishing up some advanced grip work and interrupt me right in the middle of the exercise. I ignored him – but only for a while as he was blabbering on about “I want to speak to you”, or something to that effect. I hate it when people interrupt me while working out – but judging by the hasty exit he made a second or so later, I suppose he got the drift, hehe. Anyway, those are the two tips for today. Try ’em out – and keep me posted on how you do! Got done this afternoon with a quick and dirty routine straight out of 0 Excuses Fitness, and headed on outdoors for some advanced stuff. And for those that have been reading my emails/blog posts on a regular basis, I’m sure you can guess where I headed – but perhaps not “what I was doing there”, hehe. Nah – I’m sure the regular readers guessed at least ONE part of the “what I was doing” part – and that naturally was handstand pushups. Done in sets of 10, and NOT how most people (well, the majority) would advocate doing ’em – but yet – it works so well, my friend. Oh YES – it works so darn well – and the one simple thing that you can do to really up the tempo of this workout is so amazingly simple that most people just “pass it by” without a second thought. Those that have read my “Shoulders like Boulders” course KNOW the change I’m referring to – but for now, let’s get back to the “Da Xing Xing” theme, hehe. Why do I use an ostensibly strange sounding title? Well, as I was finishing up my workout with some advanced stuff THAT is the chant I heard all around me, my friend. And being I’m in mainland China – well, Da Xing Xing means “gorilla” – and being I was doing exactly what a gorilla does to build that cast iron like upper body and (quite literally) – shoulders like boulders, it shouldn’t come as a surprise that THAT was the chant. As for the exact exercise I was doing, you might have done it when you were a kid – or then again, given today’s “sissified” world, it wouldn’t surprise me if the majority of readers have either never done it – or (probably) “pooh’ed pooh’ed” it off as “kiddie stuff that adults don’t do”. Well – human adults might not – but adult gorillas – and apes sure do on a regular basis, my friend. And that one exercise was – what? 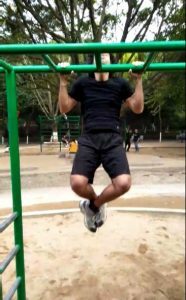 Well – simply swinging myself across the monkey bars, my friend – but believe me and trust me later, this exercise ALONE can give you an upper body workout you won’t believe if you – DO THEM – RIGHT! That’s right – most people, including a lot of kids do NOT do them the way they are really supposed to be done to build strength and endurance – GORILLA like strength and endurance at that. Most adults do what I call the “wimp out” version of it – which is to NOT use your thumb when doing these. And while I hear a lot of the “experts” are gonna “round on me” for saying this, I’ll say it anyway – any pulling exercise done without the use of your thumb is a COLOSSAL waste of time. You were given your thumb for a purpose – and that is to GRIP. Take the thumb away – – and you reduce both the intensity – – as well as the GRIP building effect of these exercises. And believe me, it’s all most adults can do to even “grip” the monkey bars correctly and hold on for any length of time – much like swing across like I was today – – and certainly NOT pound out sets of pull-ups after that. Again – if you’re doing any form of gripping exercise – – do NOT “wimp out” and use straps, aids, or (worst) do a “fingers only” version. Big, big mistake, my friend. And last, but not least – is this method pretty? Nah – not really. I’ve got calluses the size of golf balls on my palms, and it hurts like a ***** sometimes when I first grip – before I warm up – especially in cold weather. Hell, I’ve split my calluses wide open during a workout and continued – but guess what this does? This sort of training not only makes YOU tough – not only gives you that GORILLA like upper body and UNNATURAL grip – but it’ll also make a MAN out of you, my friend. And as for the calluses – they’ll rip away and be replaced by tougher skin in no time at all. Trust me – been there – done that – and do it on a darn near daily basis, hehe. So that’s today’s update. This post contains not one – not TWO – but THREE valuable tips which will enable you not just to build your GRIP – – but your ENTIRE body, my friend. See if you can spot ’em! I keep hearing it so often that it’s almost part of my “subconscious lexicon”, hehe. “Wai guo ren hao li hai”. While doing pull-ups in strict letter perfect form. “Hao li hai!” while doing an advanced variation of an already advanced (yet in the works) course “King Kong Fitness”. “Wah! Hao li hai!” while pounding out sets of squats in 100 – – and in less than THREE minutes for each set at that before instantly jumping into more pushups. In Chinese, “hao li hai” literally translates “into good, very good!” , or “more excellent”, for lack of a better literal translation. ‘Tis nice to hear, although I could care less what folks think about my workout to be honest. I’ve been classified as certifiably insane when it comes to working out – and I’m VERY comfortable with that tag, hehe. Now, what do I mean by a “hao li hai” mentality? Be the – or I should say, AIM to be the best at what you do. Actually, don’t just aim. AIM – but do so with an overwhelming DESIRE to be the best at whatever it is that you do in life, my friend. “Stone Cold” Steven Williams, he of the famous (and legendary) “Austin 3:16” brand in the WWE was interviewed on many things a few years ago, and I had the pleasure of watching this interview on YouTube. I’ll post the link shortly, but for now, let me say that I’m certainly no fan of the steriod abuse (rampant at that) and everything else that goes on in the WWE – but I AM a huge, huge fan of Steven Williams if just for his work ethic – – his sheer PERSONA (that he brought to the table – no explanations needed there eh ) – – but most of all? Most of all his DESIRE – and DRIVE to be the BEST! “I don’t care what it is, or what I’m doing. I want to be the best at whatever it is that I’m doing”. And so forth – quoting “almost” verbatim there from memory, but thats what he said. And you’ll find this trait shared amongst ALL successful people – bar NONE, my friend. You name someone whose achieved a great deal of success in ANY field – and I’ll show you a person with the aforementioned desire. On the other end of the spectrum, I saw a sloth bear today trying to get onto a teeny weeny little “scooter”. Actually calling this aberration a sloth bear would be doing a gross, gross disservice to the bear and animals in general – it was actually a “human” animal, if you get my drift, hehe. A 400 lb or probably more man with nothing but FLAB – flab galore bulging ALL over his body getting on to a scooter – and “scootering” on for about 10 seconds before he alighted from said scooter, and ponderously huffed his way to his next destination. Presumably before collapsing in a heap. Looks like he had the DESIRE to be the best as well – at being OBESE, hehe. I’m sorry but anyone who needs motorized transport to get from point A to point B with point B Being less than about 10 seconds brisk walk away has got serious issues, my friend. Oh well. So be it, hehe. So THAT is today’s tip, my friend. Last, but not least, being the best may sound like a pipe dream when you’re currently unable to do even a single rep of what I mention in 0 Excuses Fitness – – but it’s not, my friend. Start small. Dream big, but start small. Start by doing ONE pushup. Build up to FIVE. Pretty soon you’ll be up to TEN. And so forth. Baby steps as they say, but boy oh boy do they work! DREAM BIG – DESIRE BIG – and last, but NOT least – ACHIEVE BIG, my friend. P.S. – There’s an interesting corollary to being the “best” in that this comparison usually evokes the term “mastery”. Fair enough, and rightfully so, but it’s nigh impossible to be a TRUE master at anything you do, my friend. Does that mean you can’t aim to be the best though- and keep improving even when you ARE the pinnacle? Gosh, almost forgot to tell you this in the last email so excited was I when I sent you the last post. If you’re wondering why you’re not receiving emails from me over the past couple of days, well, it’s because my email service provider decided to suddenly “freeze” my account due to what they call “high bounce rates”. Apparently they’re under the mistaken impression that I “purchased” email lists – and those that know me (and that have signed up) know NOTHING could be further from the truth. 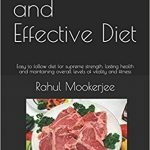 The list that I send to – and the list that those that have signed up are on was the one ported over from my old www.rahulmookerjee.com site (and worry not – I’ve got other plans for that site – in the works as we speak). What probably ended up happening is my “couple of years long hiatus” on the old blog resulted in a somewhat stale list in terms of some email addresses, and that caused the current situation. All good “in the hood”, hehe – but it does mean you’ll have to sign BACK up for the 0 Excuses Fitness daily email dispatches. Ok – out for now! Bodybuilders want it. Fitness enthusiasts want it even more. And the average Joe CRAVES it. Heck, if you ‘re sitting here reading this, you probably crave it too – big time. What is it, you ask – well – as you’ve probably guessed its that coveted “lat spread”, my friend. And I ain’t referring to the bloated muscles the “bodybuilders” (I’m using quotes there for a reason as most of said folks follow the exact OPPOSITE practices that are required in order to TRULY build the body up) preen, prance and show off on stage. No, I’m referring to a REAL lat spread – and shoulders that smack – nay REEK of real power. Shoulders and upper back that are every bit as powerful as the ripples of muscles under the skin would seem to indicate – and the overall package comes together with the LATS – spread out WIDE – just as bat’s wings – or eagle’s, even. In fact I prefer to call them “eagle’s wings” if just for the bald headed eagle sheer WINGSPAN, my friend. And while you’ll never quite get close to those levels, the ONE exercise that most folks think of when it comes to lats is not really the TRUE lat builders, although it ranks right up there. No, it’s not the worthless piece of junk that they call the “lat pulldown” machine. If there was ever an useless machine that ranks right up there along with the “padded” chest press machine (a.k.a sitting on your fanny and grunting and moaning out a few “padded” reps) it’s THIS one. And it’s not pull-ups either – although pull-ups are a great, great, GREAT exercise – and CAN – and SHOULD be included in your routine once you get past the 0 Excuses System “beginner” stage. Well – it’s the HANDSTAND pushup, my friend. Simple. This one exercise done correctly will build not only lats that look like soaring EAGLES – but strength to go with it. Think BULGING traps, my friend. Think MONSTROUS traps – and INSANE pressing (and pulling) power to go with it. Stuck on pull-ups? Well, one of the hidden keys is to … Ah, but I’ll let it go for now. And to round off the package think grip strength from Cain without even working the grip directly. Well – nah – let me rephrase. Think REEKING OF SHEER – and UTTER – BREAK THROUGH THE WALL – CONFIDENCE when you’re finally able to bang these out in proper form! That – my dear reader, to me is the MOST important thing about handstands and handstand pushups – the feeling of BLASTING through barriers that you get from these! You CANNOT replicate this feeling with any other exercise that I know of. Pull-ups and high rep Hindus come close, but they stop at “close”. Believe me now, and trust me later – this one exercise is the undisputed KING of all toughies out there – and it makes you FEEL like a King (or Queen – yes, you ladies CAN do ’em) as well. I don’t recall mentioning “lats like bats” on the sales page for this, but all good – that’s task #2 after finishing this dispatch, hehe. In Shoulders like Boulders, I’ve posted a picture of myself at a good 20 or so kgs OVER fighting weight as it were to show my own “spread”. NOT for reasons of vanity – thats for sure. Just to show you that YES – BIG guys can do ’em as well – and if you fall into the big category – well fear not, my friend. Build up a base with 0 Excuses Fitness, and THEN progress on to THESE. And once you start cranking these out – who knows? You might even surpass Doug Hepburn who I consider to be the MASTER of handstand pushups (all time!) in terms of sheer handstand pushup abilities! The sky, my friend is quite literally the limit and if you’re seriously interesting in developing the BAT wings that you’ve always craved – well – then – look no further, my friend. I’m off to update the sales page now. Back later! Uh – well, think away, my friend. You may pack on some “rubbish” external mass with the lat pulldown machine, but you’ll only do more damage to your body in the long run. And you’re NOT – I repeat – NOT going to get ANYWHERE near the levels of strength, conditioning – and CONFIDENCE that the handstand pushup correctly executed can and will give you. Not a chance in hell, my friend. OK – I’m off for now! Back later. Was browsing through the blasted smartphone “updates” – or I should actually say “chat app” updates and looking at the latest nonsense galore. Scrolled past a ton of selfies, and a video of an obese man trying to stuff a Micky D’s burger down his gullet – and this man wasn’t just obese. He was SUPER OBESE – probably about 400 lbs at the least, and what he was eating obviously doesn’t help his condition. What was somewhat hilarious about the video though (which I believe was a tongue in cheek effort at saying “I’m lazy – leave me be”) was that he had three cats and a dog all jumping up and down “vying” for a bite of the burger – and the cats managed to nip a few bites in while jumping up and down on his belly of Buddha (which of course “rippled” like tidal waves every time one of the cats landed on it). Hilarious – and yet so sad – and what the dude said to close things off was “This is what I deal with daily as I eat my food. You’d think I’d be a thinner person with these little ***** around”. Moving on past that, more selfies and other nonsensical updates on “what I had for lunch”. I’ve never understood why folks post pictures of food they are – ostensibly “normal” food – do you? I mean perhaps if you ate a crocodile with your bare hands – yeah – that would make a sight worth viewing, but simply posting pictures of a meal out at TGI Friday’s, or glasses of cold brew? Don’t particularly think THAT is a sight worth “sharing” for “novelty” – or is it? Heck – maybe I’m just old fashioned – but anyway, so on past all that … I saw another update from a friend saying “I bought a sleep tracker recently”. Huh? What? They’ve got devices to track your sleep now too?? I know they’ve got smartphone apps to track the number of steps etc you walk daily. I wore a little band around my wrist one day to track how many steps I walked during my 1:05 long workout (at the time) and I think it was around 20,000 or so. More than what the average sloth potato … aka dude in the video, and others like “it” walk in a month or year I’m guessing. The only time some of these folks get up to walk is to go to the bathroom or “get another cold one” – and I’m NOT kidding. Any other activity is limited to grabbing a fat hand out at the drive through’s at Micky D’s, or popping soda can tabs. Anyway, I looked at some of the screen shots he posted. Its apparently an app that tracks your sleeping patterns – what time you went to sleep – deep sleep patterns and how they compared to other using the app – a couple of nifty looking graphs – and other bits and bobs, along with “suggestions” on how to achieve better deep sleep if you aren’t already. And at that point I put the darn phone down and plugged into the charging point which is presumably where I’ll leave it for the next few hours. Gawd, the amount of junk out there. Ok, smartphone related rant (albeit deserved in my opinion) over – but as far as sleep is concerned, it’s a proven and known fact that the majority of the population WORLDWIDE are having trouble falling – and STAYING asleep – at NIGHT. And that’s not good for reasons you already know, my friend. Even if you aren’t training hard, poor sleep or lack of it causes you to sleepwalk through the rest of the next day and sleep when you should NOT be. Funny part is – most people don’t need near as much sleep as we’ve been “taught” we need – in fact less if you TRAIN right. And eat right – but more of “training right” if you get my drift. Well – here is what yours truly does. I usually NEVER get to bed before 2 A.M. or so, and generally rise no earlier than 10 A.M. If I’ve got things to do in the morning such as I do this week – I’ll rise at around 8:30 A.M., but NOT earlier than that – and guess what – my bedtime remains the same – and my workouts remain just as intense. And after a full day, and a no-nonsense, FAT BLASTING – INTENSE routine – guess what. I don’t take more than a minute or so to lop off to sleep when I finally hit the sack. If anything I’m OUT like a LIGHT and I stay that way until I wake up. Point of me telling you all this? You don’t need to buy “devices” to track the number of steps you walk, my friend. You sure as heck do NOT need to buy “sleeping trackers” and other “sleeping aids”. The best way is to do it naturally – via INTENSE – REGULAR workouts that get the blood flowing, heart PUMPING, and your entire system working at a deeper level than it’s ever been worked before – and PROGRESSING regularly! I mentioned the part about “sleeping like a log” (or something to that effect) on the 0 Excuses Fitness System sales page, and it’s NOT hype, my friend. It may sound like it, but it’s not. When you do these exercises, you’ll need none of the other junk. ALL the benefits I’ve mentioned on the page are TRUE – and as far as sleep? Well, let’s just say you’ll NEVER EVER have a problem falling asleep once you start working out the way I advocate, my friend. No more sleeping “trackers” – no more “sleeping pills” – and certainly no more “Belly of Buddha”, my friend. No frustration. No self esteem issues. An abundance of confidence and a feeling of being able to RUN THROUGH WALLS at a MOMENT’s NOTICE – these (and more) are but the tip of the iceberg here, my friend. So if either one of the two examples I’ve mentioned above resonates with you – well – take action, my friend. 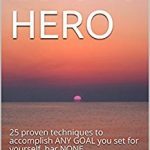 Get your copy of the 0 Excuses Fitness System – – https://0excusesfitness.com/0excusesfitnessystem/ and watch your health – – sleep — and LIFE transform for the better almost instantly. I still remember that day when I was 17 years old, and I fell out of a running bus – – right SMACK on my right shoulder, which luckily didn’t pop right out of it’s socket, mostly because I rolled over … right onto my right wrist. Another huge OUCH – and I still remember the onlookers staring but not doing much of anything as I somewhat painfully picked myself up, dusted myself off, and walked away. Went home, and figured (unlike today) that the doc was the best place to go after the mishap – and long story short – the entire right forearm was in a cast for a week or perhaps about 10 days IIRC. And given my “small bones” and weak natural grip – ’twas a wonder I didn’t break my wrist during the fall. Fast forward a few years to when I was around 25. In great shape, yet nowhere near the shape I am in NOW – and I was banging out pushups by the hundred(s) daily – and yet developed a nasty bone spur from doing handstand pushups when I was NOT ready for them. Fast forward a few years to NOW – when the guy who couldn’t build his grip to desired levels for all these years has finally GOT it – – and got it at levels that would literally astound the average person. In the much acclaimed “Gorilla Grip” course that I put last year, I’ve spoken numerous times about my own grip – and obviously, what I did to build it to astoundingly strong levels (all the more “mind boggling” considering I’m neither naturally gifted nor a big guy). The testimonials page mentions my grip – as does the actual Gorilla Grip sales page itself. In fact, I outgrip most guys that are bigger than me that I know of – and by quite a long shot, and while that might sound like I’m “tooting my own horn”, that isn’t the intention. Nah – the intention is simply to tell you that if someone whose grip used to be his WEAKEST link got it up to a point where it’s now by far one of his STRONGEST – then you a) CAN do it and b) have NO excuses left. And though ALL the exercises in both 0 Excuses Fitness and Gorilla Grip do a super, super job of developing the grip – – there is ONE that does it the best, my friend. And it’s not necessarily pull-ups done right, though those work great. It’s not using grippers. It’s not putting your hand in rice. It’s certainly not doing countless reps of “bunny curls” and trying to”get that pump”, hehe. Well – I mention it in Gorilla Grip – and it is – the humble and much ignored fingertip pushup. Believe me, this ONE exercise done by itself WILL give turn your fingers into CLAWS, my friend. The fingertip pushup used to be a favorite of old time strongmen, wrestlers, boxers and the like. And any REAL strongman today will tell you that the fingertip pushup is a MUST in his arsenal of “strength tools” – if not one of the MOST important. Most folks find these way harder to do than regular pushups, and with good reason. These tax the fingers and forearms a LOT more than the larger chest muscles (as opposed to regular pushups) – and that, combined with the “pressing” motion on the tips of the fingers is what builds amazing gripping strength throughout your entire forearm. It’s “old timer” like strength. Believe me, some of the old timers could grab you in a vice – and do some serious, serious damage with their fingers and palms alone, my friend. Contrary to what most people think, fingertip pushups are NOT done with “straight” fingers. They are done with your fingers somewhat bent – and that’s a detail hard to explain via the written word alone – but one I believe the 0 Excuses Fitness System explains pretty well. Work these into your routine, my friend – you’ll soon see why I recommend these so highly once you start to actually DO them. Be careful too that you don’t “overstress” the fingers either knowingly or unknowingly. You’ve no doubt read about my nasty thumb injury a couple of weeks ago where the thumb literally popped out of it’s joint and back … YEEEEOOOOOOWWWW! By Golly, that was painful, and it’s still not fully recovered, hehe. That was admittedly me doing a super duper tough variant – but I’ve had this happen to me even when doing regular fingertip pushups, although the limb recovered fairly quickly in the latter case. Be careful when doing these. Work up to higher reps with CONTROL and CAUTION – and always, always maintain proper form. It’s easier to “bounce” up and down while doing this one as your chest muscles aren’t involved that much – – do NOT do this. Maintain the exact same form as you would in a regular pushup. Other than that though – – work this one amazing exercise into your routine – and watch your forearms literally start to “swell” to “PopEye” levels in front of your very eyes. Not to mention the kungfu grip you’ll get when you do these! OK – that’s it for now. I’ll be back again later! Parallel grip vs regular grip pull-ups? The debate rages on, doesn’t it? Which is better – parallel grip pull-ups – – or regular grip “military style” pull-ups? Before I wade into this (yet again, by the way – I wrote a post on this years ago as well on my old blog) – let me just say that I’ve heard plenty of arguments for and against both styles being the “better of the two”, but I’ve never heard anything against either style per se. And with good reason. Both styles are GOOD – and both have their benefits. However, at the end of the day, the regular (i.e. palms away) pull-up is by the far the KING of “pulling” movements, my friend – at least to yours truly. Well there are plenty of reasons but the #1 reason being this is the most NATURAL style of pulling. Think about it – when firemen carry a hose up a building – what grip do they use? Pronated, or supinated? When you see a bar, and “hang on” (as opposed to stop and burp, hehe) – – what is the most natural way to do it? Palms away, or palms facing ya? I thought so, my friend – and that is but one reason. The #2 reason is how they make you FEEL – doing SLOW, STRICT reps on the military pull-up will make you feel like you’ve conquered the world if you do ’em right – and I ain’t kidding, bro. There’s a reason the Marines and other elite forces around the world use this sort of pull-up as their primary “to go” strength and endurance test in terms of upper body strength. Now, does this mean the other forms are necessarily bad? Not at all. The commando pull-up – – one which I’ve spoken about in Pull-ups – from Dud to STUD is often ignored, and is a great, great movement indeed. As for parallel grip pull-ups, there is nothing wrong with them – and they do have their benefits, but they don’t build the grip and upper back NEAR as much as regular pull-ups do. That doesn’t mean though that they don’t build said muscle groups at all. Wrong. If you’re just jumping off a year-long haitus on the ole couch or car seat – THIS style of pull-up along with what I mention (as a starting point) in the book will get you going pretty quick – and will likely seem easier. But will it build more strength? Not a chance, my friend. Not a chance – and does it tax the obliques more, you ask? Well – while it may seem like it does – I don’t think so. I’ve never quite felt my midsection work like it does (while doing pull-ups) when I do ’em regular military style and that’s really the bottom line here. A lot of the advice on how to do pull-ups out there is good – and a tremendous amount of it is BAD. Just for the record – you do NOT either “kip” or use momentum to do a pull-up. This will make it a lot harder, and you’ll take a lot longer to get past the beginner’s stage – but when you do? You’ll have developed an ELITE level of strength that few around the world will be able to match, my friend – and I am NOT kidding ya. And the other thing to watch out for is either consciously or otherwise “swinging” at the bottom. This can end up happening at times if you’re not aware of what you’re doing – I actually noticed myself swinging just that little bit today after my pull-ups, and instantly corrected myself. So there is my take on it. And if you’re part of those that are reading this and “wistfully” wondering when you’ll get past the “5” stage in pull-ups – – not to mention 10 – – or 20 – – or more? Well, don’t worry – there’s a great many people out there that fall in this category. Order NOW – and get cracking – I look forward to hearing back from YOU on YOUR progress! P.S. – Invest in this today. It’s far better with living with that “hidden ignominy” of not being able to pound out a single pull-up, my friend … You know it, and I know it. And if you still have any doubts – – think of how you’ll FEEL once you get to that ELITE level of strength. I’m gonna do something a bit different for this post – something I normally never do. Y’all (especially the regular readers) are WELL aware of my much publicized hatred for smartphones and selfies – and folks trying to pester me during my workouts – but yet – I made an exception today. ‘Twas a portly looking Chinese gentleman who was looking on awe as I pumped out pull-ups – and other secret strength builders that are detailed in the pull-ups course – and of course, I complimented it with you know what. What you probably DON’T know though is this – all this was done as a ‘finisher’ after a 1:25 hour long workout – and that wasn’t easy by any stretch either, my friend. Pictures speak louder than words and I’ll post a couple here. Videos speak EVEN louder but – being I was in the park and naturally did NOT have my smartphone for this part of the workout – all I got were “short” videos – pretty much because large videos apparently weren’t going over the network or something to that effect. Certainly nothing like the videos in the 0 Excuses Fitness System where I explain everything STEP by STEP – – and yet – – not to worry, I’ll get these advanced videos done as well once Cindy gets back. For now though – here are the pictures. The “six” pack effect (or perhaps even 12?) that 0 Excuses Fitness WILL have on YOU should be fairly evident from the pictures. Disclaimer – – Do NOT try this unless you’re already at an advanced level – and EVEN if you are – do NOT, I repeat, NOT try this AFTER a workout – unless you’re at a crazy enough level already, hehe. For those that think bodyweight exercises are a joke – well – think again – or I should say, think SEVERAL times, my friend. And think about a bazillion times after you incorporate HOLDS into your routine! This is Gorilla Grip / Strength Volume ZERO – or should I say NEGATIVE – and yet, it would kick most people in the can to just GET into this position – let alone after a workout. Enjoy – oh, and thank you, my friend for the “impromptu” pic/video session. Much appreciated, hehe. P.S. – Shoulders that smack of raw power – an “unnatural pull” grip like a pair of pliers – and the look of SHEER AWE when “portly” gentlemen, bystanders and “lookie lous” look on – – who would NOT want it?